Admit it. You’ve probably defaulted to this response, without thought, at least once. It might have been motivated by sheer frustration. Or a need to make things happen quickly in the face of a ticking clock. Perhaps the details were too complicated for your child to understand. Or maybe the words spilled out from a long-buried memory of your own mom saying the same thing. 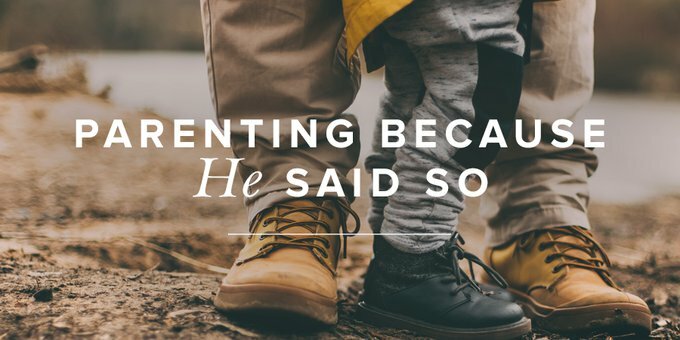 There’s a better way than simply answering your children out of habit—the way of training them while trusting in the One whose authority overrides all others. This sort of thoughtful child-raising starts with teaching your children (and reminding yourself) about the nature of God. God is Creator, and He chose to create and work through the family unit. God created all things, including the family. The family unit is important enough to God that He confirmed it in the Ten Commandments: “Honor your father and mother.” It’s also the first commandment to include a promised blessing (Eph. 6:2). Our culture works relentlessly to label the traditional family unit irrelevant. Regardless of society’s opinion, God established the family as the primary structure in which individuals are loved, nurtured, and taught. Talk to your children about what it means to be part of a family. Encourage them to identify ways they feel loved and cared for within your family and your church family. God is sovereign, therefore He delegates His authority to whomever He chooses. God has the right to rule His creation because of who He is. Circumstances may conspire to convince us otherwise, but God’s authority is always right and good because His character is always right and good. One of the ways He chooses to delegate His authority is through the family structure. We don’t always recognize when God is at work. But whether we see it or not, He is continually acting to fulfill His plans and purposes (Isa. 46:9–10). When we belong to Him, we have the assurance that He is working for our good and for His glory (Rom. 8:28). Whether or not we like the authorities God placed in our lives, our children are watching how we respond. Do you speak politely of your employer? Regardless of your opinion of the incumbent, are you respectful of the office of your country’s presidency? There is much truth in the adage, “Children learn what they live.” What are they learning in your home? What would happen if we looked to God’s Word to find solutions to problems and taught our children to do the same? Rather than giving them the answer, what would be the result if we aided them in finding it in the Bible for themselves? Doing so will help them see Scripture as the authority by which your whole family lives. God is a God of order, therefore our families reflect His order. Submission is not a popular word. Some think it implies inequality. But while the Bible speaks about submission, it also says men and women are equal in Christ (Gal. 3:28). Equal, yet different. The ancient Greek word for submit is a military term. It refers to arranging life in order under another person. When we submit, we arrange our lives in order under the one we are submitting to. It does not mean the one submitting has less value. Submission simply communicates order, similar to the way soldiers are ordered in military ranks. This concept of equal but different roles began in the Trinity. The apostle Paul wrote, “The head of every man is Christ, the head of a wife is her husband, and the head of Christ is God” (1 Cor. 11:3). Jesus said, “My food is to do the will of him who sent me” (John 4:34). If equal but different is good enough for the Trinity, it’s good enough for us! It’s easier to teach children to submit to you as their God-ordained authority if they see you modeling submission to your God-ordained authorities. God is holy, therefore He expects us to be holy, too. Holiness is an old-fashioned word. We don’t often incorporate it into our conversations. Yet not only is this an attribute of God, it’s also His expectation for us (1 Peter 1:16). It has been said God is more concerned with our holiness than our happiness—a truth that does not appeal to our human nature. And if holiness doesn’t appeal to adults, how can we expect it to appeal to children? Still, parents are responsible to “train up a child in the way he should go” (Prov. 22:6) and to bring children up “in the discipline and instruction of the Lord” (Eph. 6:4). This often means making unpopular decisions, the type that prompt a mournful face and a whining “Why?” Just remember, happiness is temporary, while a holy character is eternal. When decisions result in temporary unhappiness, redirecting your child’s attention to what God might be doing through this experience can make a big difference. Emphasizing the positive will help them grow up without thinking of God as a kill-joy. God is immutable, therefore His requirements for us are still the same. Because God is perfect and not dependent on anyone or anything, He does not change (Mal. 3:6). Still, it’s easy for children to echo what they hear in our culture. Don’t be surprised if older children protest that the Bible is old-fashioned and irrelevant. How will you respond when they do? Just as God’s nature is unchanging, so is His Word. It’s true: The world’s standards of right and wrong vary based on cultural norms. But we can rely on God’s character and His Word as an anchor that holds fast (Heb. 6:18–19), despite the shifting impulses of society. The sovereign Creator who is holy and unchanging is the One who established the family unit. Regardless of the decade or the culture, parents are tasked with the responsibility of teaching God’s unchanging Word and principles, “talking of them when you are sitting in your house, and when you are walking by the way, and when you lie down, and when you rise” (Deut. 11:19). As your children become comfortable using the Bible as the standard for their lives, encourage them to broaden their perspective. Help them look beyond specific historical references to the principles behind them. For example, many Old Testament penalties for sin are no longer practiced. But if children see the importance God assigned to holy living then—and now—they’ll begin to realize the principles of His Word are timeless. When we think of the authority of God, our own authority pales in comparison. However, we know the basis for parental authority is found in God’s character. This gives us a solid foundation on which to fulfill the call to parent the next generation.